Dan Kleintop submitted this photo and caption. 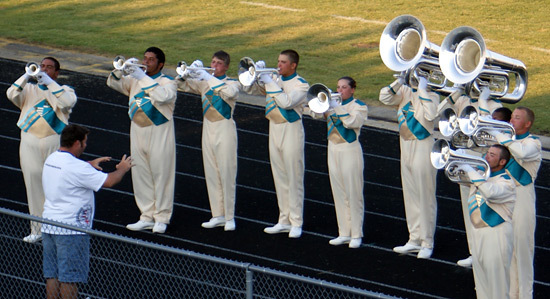 This photo was taken at the Tidewater Summer Music Games held July 7, 2009 at Kings Fork HS in Suffolk, Va., and is of a Teal Sound ensemble performing the National Anthem prior to the competition. As a trombone player since I was eight, over the years I've added euphonium and tuba to my arsenal. I marched for six years in junior and senior high school and for four years with the Marching Virginians at Virginia Tech. While I've never participated in a drum corps, I certainly love to experience their performances.